There is something so unexpectedly sweet about Ouran High School Host Club. For a story predicated on the absurd and littered with the silly, what ties it all together is really a very genuine undercurrent of affection. It’s like the host club is just a group of rich but lonely and complicated boys who have found a positive outlet together to make merry and be carefree. Watching this drama reminds me a leeeetle bit of Nobuta wo Produce, the feeling of watching oddballs find friendship in each other and grow to be as strong as a real family. Episode 8 was lots of fun, unveiling Nekozawa senpai for the first (and maybe last) time, and dropping a ton of clues about Tamaki’s backstory. Oh, and Kyoya and Haruhi continue to sizzle up my screen just by having the most mundane of conversations. Haruhi arrives at school to see a car pull up to the front entrance and out walks the principal of the exclusive Ouran High School. He stops when he sees Haruhi. He approaches her and correctly identifies her as Fujioka Haruhi. He asks her to come to the principal’s office. Inside the principal’s office, the principal compliments her good grades and hands her a gift of letter paper and evelopes. He then flounces over to the sofa as he discusses how the Ouran scholarship program was a manifestation of his dream to be a daddy long legs. He tells Haruhi not to feel indebted to him, just write him letters of gratitude will be fine. Haruhi makes a “what the heck” expression before asking the principal if it would alright for her to write him periodically. He’s fine with letters written unexpectedly, and reminds Haruhi to let him know when she runs out of stationary. Then he pops over to sit next to Haruhi and grabs her hand. He’s heard about her cross-dressing need and feels terrible about it. If she needs help, she can come to him anytime. He summons a rose from the air and hands it to her. The principal is reminded that it’s enough for now, so he goes to strike a pose, and then sits down to pluck the rose petals while chanting “protect you, not protect you”. Haruhi looks at him and thinks he’s strangely familiar to her. Her mind associates him with drama queen Tamaki, but she shakes her head and says it’s not possible. 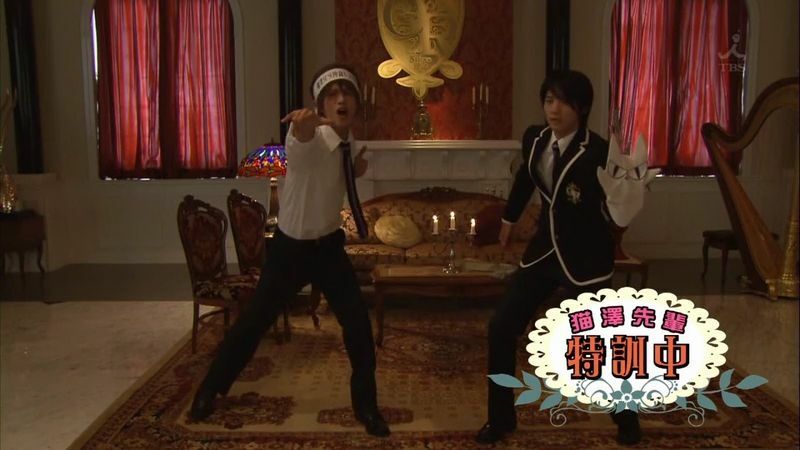 At the Ouran High School host club, today the members are all dressed in law enforcement type cosplay uniforms and subjecting their guests to interrogations and other procedural scenes. 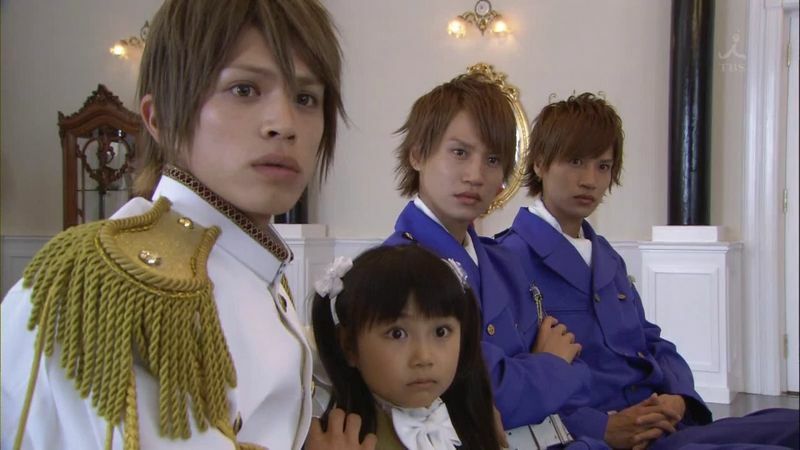 Tamaki is interrogating a guest while the twins do their shtick trying to decide who will be going on patrol. Mori helps Honey tie his necktie. 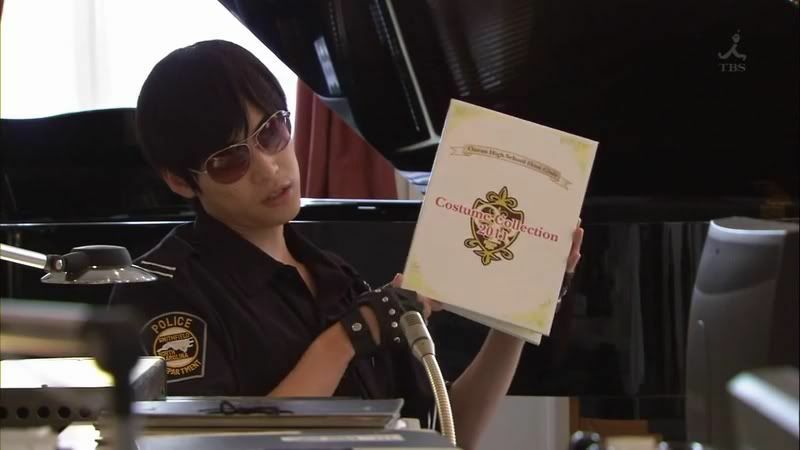 Kyoya is holding court in a mock police station set up, selling host club cosplay albums with a very authoritarian attitude. The ladies (and Koala) slurp it up. Haruhi notes that she’s not even weirded out by their behavior anymore. 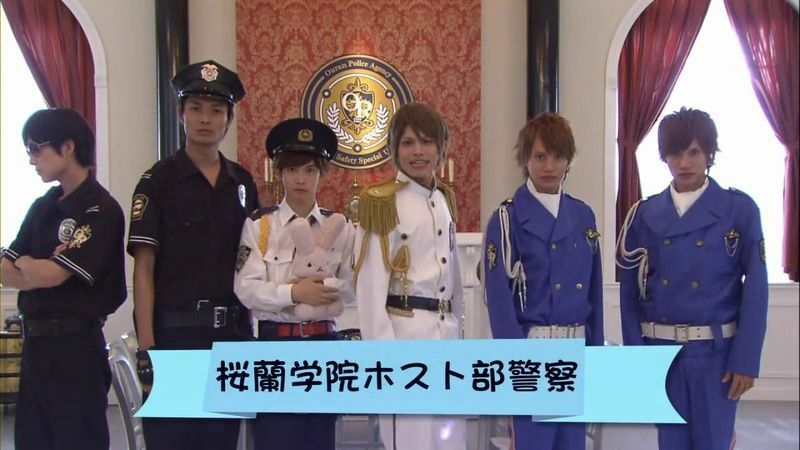 The twins approach and hand Haruhi a ladies police officer cosplay uniform. Tamaki hurries out of the cage and intercept them. He tells the twins to stop harassing his daughter. Tamaki then complains to mommy that the Haruhi’s older brothers are making her wear inappropriate clothes. Kyoya walks over remarking that a guy of 18 is still playing house like this. Haruhi wonders why Tamaki is so into playing family like this? Kyoya thinks it’s because Tamaki perhaps has some sort of longing for family constructs. The twins shoot a laser beam at Tamaki and he falls over in pretend faint. Suddenly a little girl opens the door to Music Room #3. Tamaki welcomes her, and she happily and correctly identifies this group of folks as a male harem. Tamaki is shocked and the twins can’t imagine a little girl would know what a male harem is. The little girl knows all right. She points to everyone and calls out their prototype: Kyoya is the glasses-wearing-type, Honey is the cute-type, Mori is the restrained-type, the twins are the forbidden-love-type, Haruhi is the bookworm-type, and finally Tamaki is……her brother! She jumps into Tamaki’s arms while everyone asks about his sister. Tamaki says he’s an only child. When he wants to clarify for little Kirimi that he’s not her brother, her doe eyes and sad face gets Tamaki to immediately adopt her and agree to be her big brother forever more. Haruhi wonders if perhaps Tamaki isn’t being a tad irresponsible, to which Tamaki vows he’ll take care of her. Suddenly Nekozawa senpai glides through the door and informs Kirimi that he is her brother. Everyone stares in shock. Sitting around the table, Nekozawa senpai explains that the little girl is Nekozawa Kirimi, his little sister. But Kirimi shrinks away from her brother in fear, which causes poor Nekozawa senpai to be totally hurt. The twins point out that his creepy dress is likely causing the fear and they offer to give him a makeover. When Mori moves to close the curtains, Kirimi suddenly shrinks in fear at the sudden darkness. 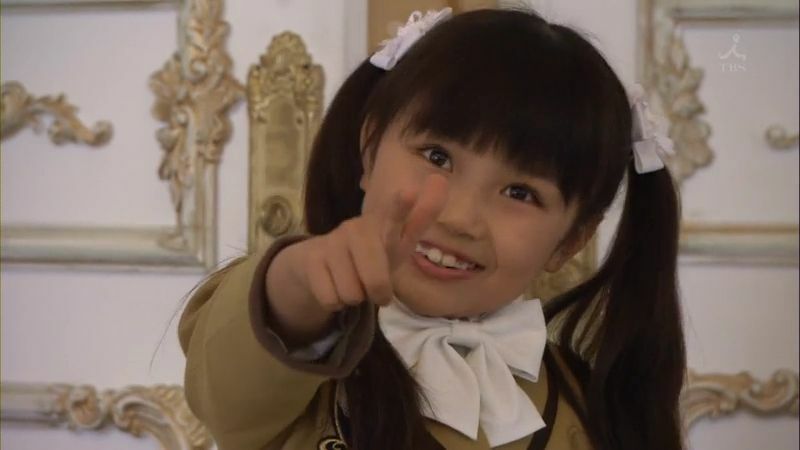 A girl walks in and introduces herself as Riko, a member of the Black Magic club. She explains the Nekozawa family is descended from Russian royalty, and every few generations a member will be born with an affinity for darkeness. 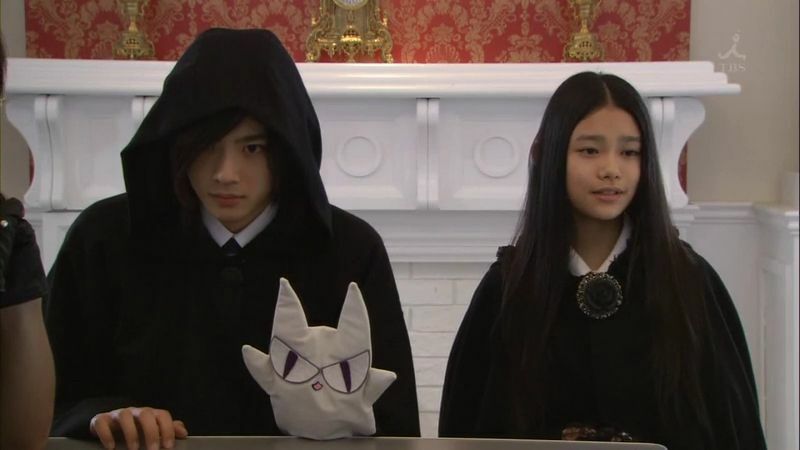 So Nekozawa senpai’s love of darkness contrasts with his sister who fears the dark. His sister in turn imagines her brother to be a shining prince and she also has a love of male harem mangas. Kirimi refuses to accept that her brother is this cape wearing freak. Nekozawa senpai says he prays to his dark gods every night for Kirimi to fall in love with darkness. The twins tell him it should be the other way around, he needs to get used to the light. When Riko offers to take Kirimi home, she jumps into Tamaki’s arms and calls him brother. Nekozawa senpai sadly asks Tamaki to take good care of Kirimi from now on. Haruhi steps forward and expresses her sadness, being an only child, at seeing siblings unable to get along. Tamaki sees this and sets Kirimi down, explaining to her that he is not her brother and her real brother is another person. 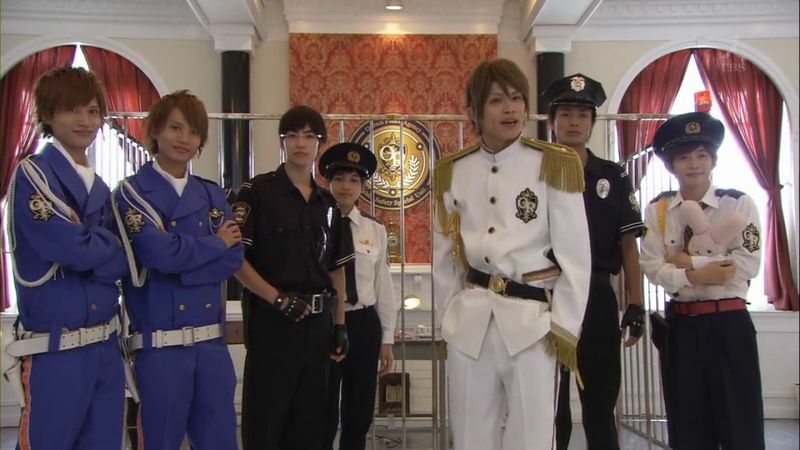 Tamaki stands up and declares that henceforth, the Ouran High School host club police department will be undertaking Project Rebuild Nekozawa Sibling’s Relationship. Tamaki will personally transform Nekozawa senpai into the type of guy Kirimi likes to see. Poor senpai screams in horror. Nekozawa senpai has gotten a makeover and practices his flowery language. But he always falls back on his black magic ways, to the frustration of Tamaki, the drill sergeant. Haruhi is outside in the foyer transformed into a preschool classroom reading to Kirimi, who insists she read book after book of shoujo manga. Inside the training facility, Tamaki has turned Kuma-chan into a make believe Kirimi and tells Nekozawa to pretend that it’s his sister and practice on it. The twins have made a pretend Haruhi for Tamaki, which is wearing the cute police girl cosplay uniform. 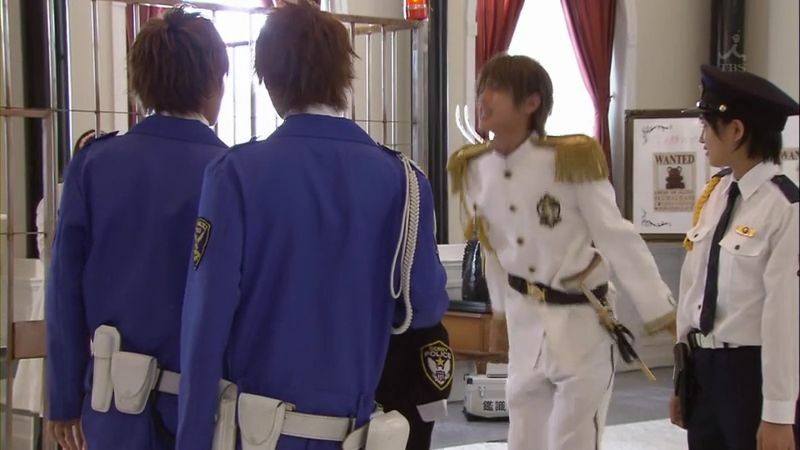 Tamaki immediately daydreams that police girl Haruhi is shooting him with her pretend gun. He calls out her name and the real Haruhi walks over completely disgruntled, accusing him of wasting time daydreaming when he could help take care of Kirimi. Kyoya asks if Haruhi isn’t used to taking care of little girls? Haruhi confesses she’s not uncomfortable doing it, except Kirimi has made her read over 50 shoujo manga volumes already. Suddenly Kirimi comes into the room and complains that it’s too dark. She cries, asking for her brother. Tamaki runs over and takes her outside. Nekozawa senpai watches and quietly asks Tamaki to continue with their training. Nekozawa senpai is being interrogated by Honey and Mori in front of a light. The twins shine flashlights on his face. 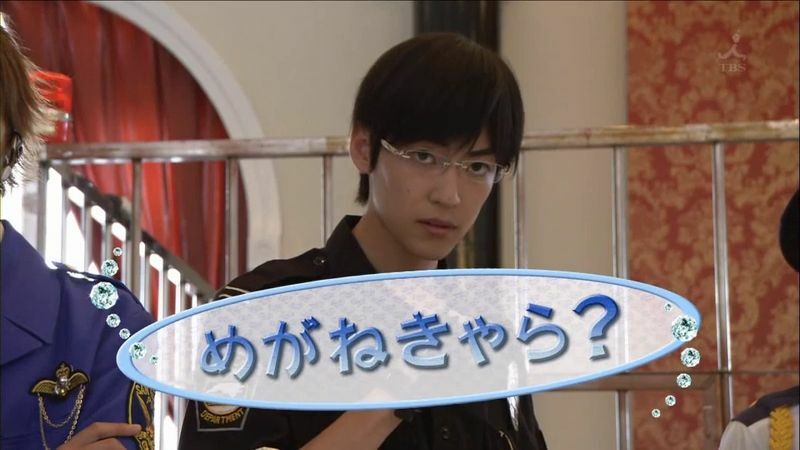 Kyoya opens and closes the curtains. Tamaki dramatically poses and calls out “No Shadow” while Nekozawa senpai keeps saysing “Yes Shadow” to the agitation of Tamaki. Haruhi is reading to Kirimi, who falls asleep on her shoulder. Tamaki runs outside to rest and sees sleeping Kirimi. He picks her up and puts her in bed. 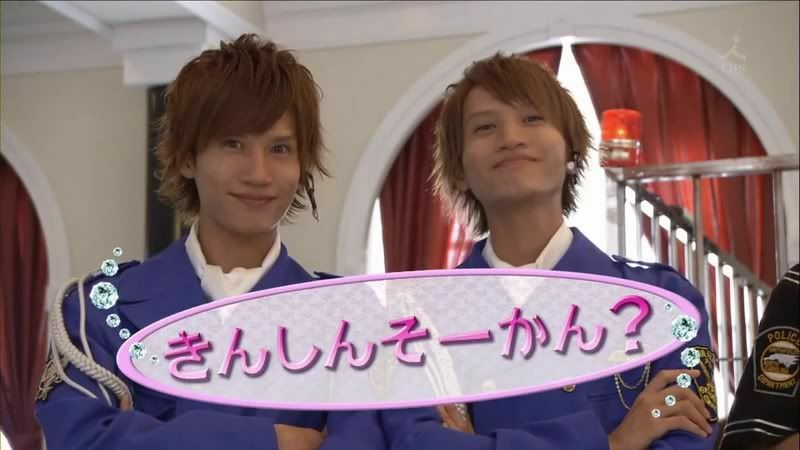 Haruhi notes that Tamaki and Kirimi do look like a pair of real siblings. Tamaki explains that he’s always wanted a sibling. His mom was always sick when he was a kid so he spent most of his childhood by her side. What made his mom happy was for her to see him happy. So he learned to play the piano and cheer her up. And eventually he decided his goal was to live his life happily and bring happiness into other people’s lives. In that way, maybe his mom would get better soon. He asks Haruhi is this is weird? She smiles and says no, asking if he’s mom is better now. Tamaki says he hasn’t seen his mom in 2 years so he doesn’t know. Everyone goes inside to watch Nekozawa senpai get tested. He passes and everyone cheers him on. Suddenly Kirimi enters and when she sees Nekozawa senpai with a flashlight shining on his face, she turns and runs away. Nekozawa senpai wants to quit. Even if he conquered his fear of light, Kirimi still may not accept him. Perhaps it’s best if her brother were Tamaki from now on. 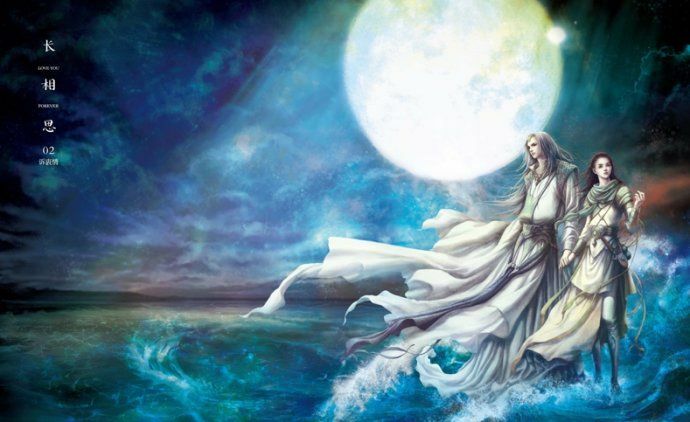 Tamaki reminds Nekozawa that Kirimi is HIS relative so he needs to summon his courage and fortitude and do things for her while she is still beside him. 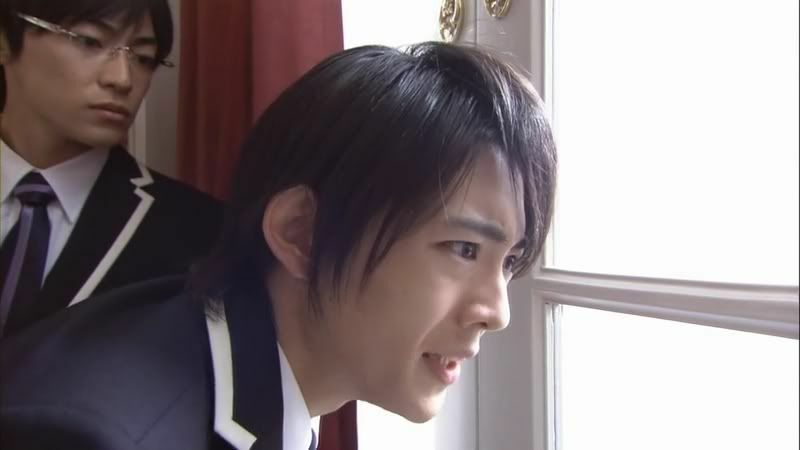 Kyoya notices that Kirimi is outside in the yard with a cat. Nekozawa senpai explains that Kirimi is frightened of cats and then he runs outside. 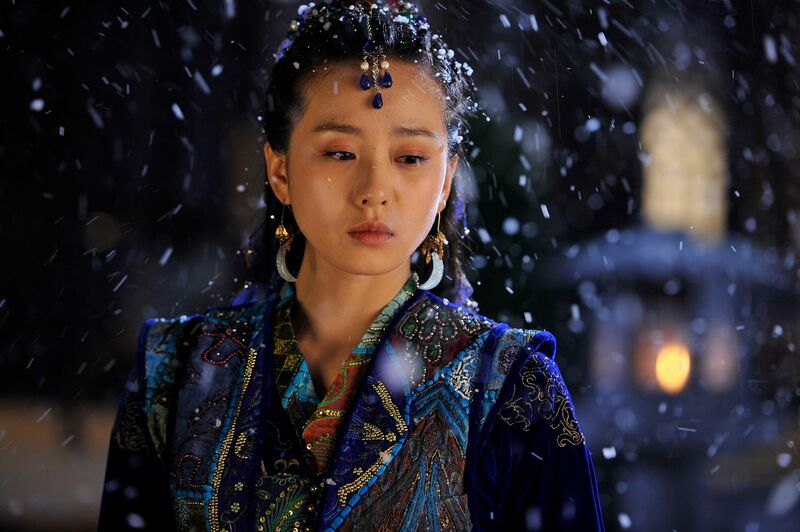 Kirimi cries, calling for her brother to come save her. Which is when Nekozawa senpai comes running towards her. Kirimi finally associates him with her dream brother and calls him onii-chan. Brother and sister hug in happiness as the members of the host club watch this reconciliation. They walk forward to congratulate Nekozawa on conquering his fears. He thanks everyone, and then promptly collapses in a faint. 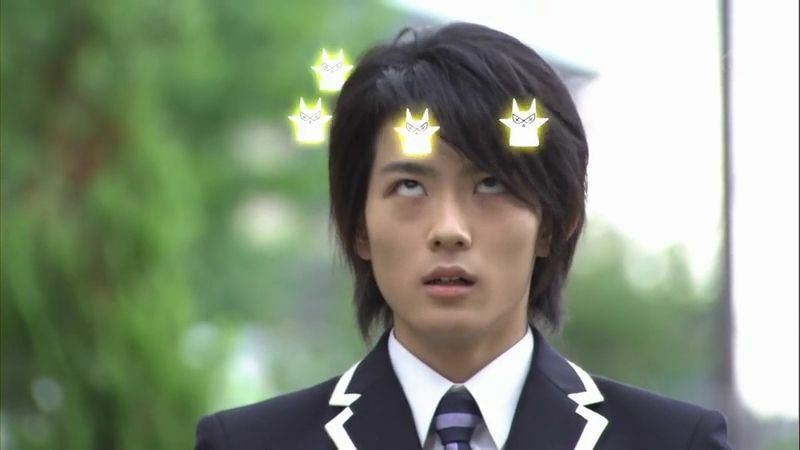 Riko checks him out and explains that his over exposure to sunlight has caused him to regress to his light fearing ways. 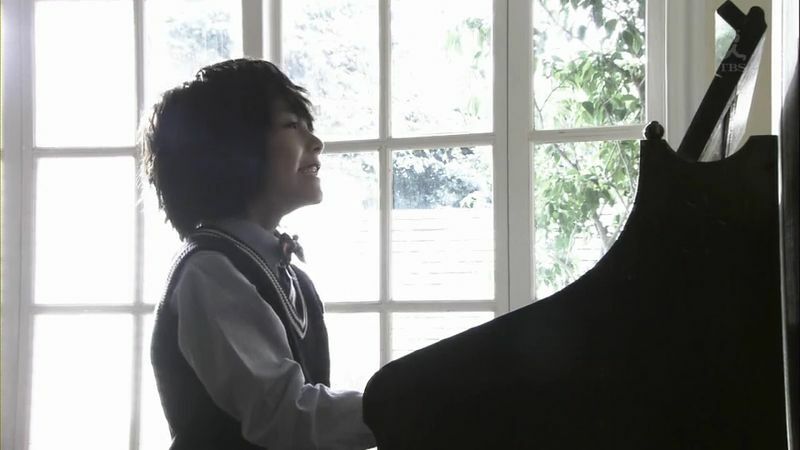 Kirimi is worried about her brother so Tamaki goes to play the piano. Nekozawa senpai wakes up and is fine. 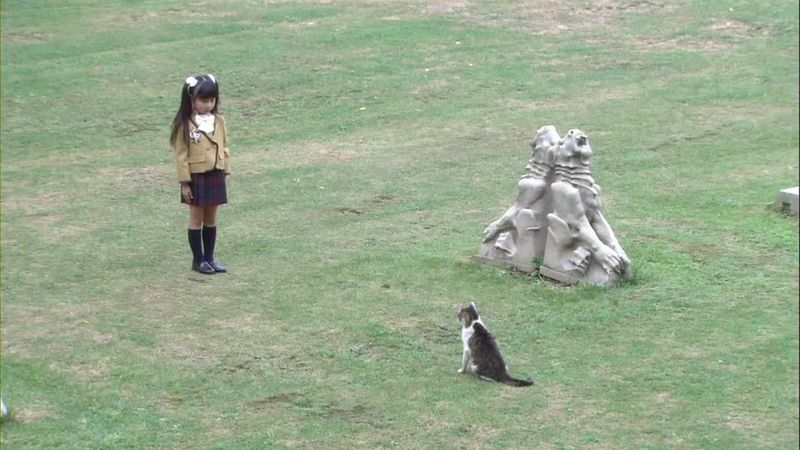 Haruhi watches Tamaki play and Kyoya walks over to ask what’s on her mind. Haruhi wonders what Tamaki’s family is like. 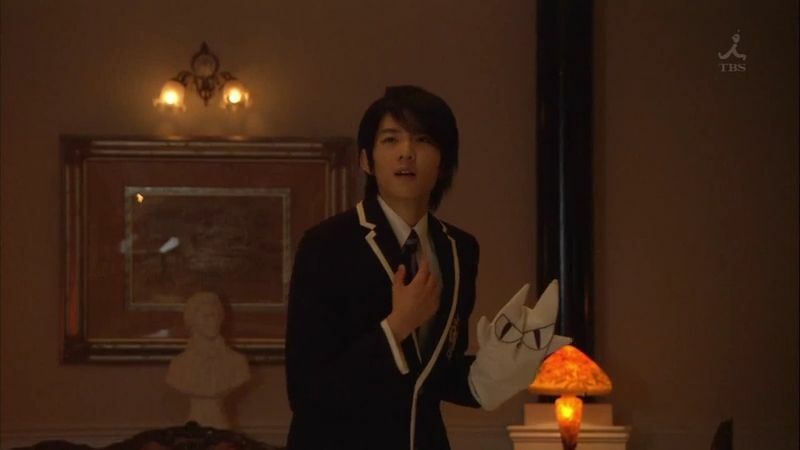 Kyoya explains Tamaki’s family is wealthy beyond belief and runs all sorts of enterprises, including a school. Haruhi is shocked to discover that the Suoh family owns Ouran High School and that the school principal really is Tamaki’s dad. Haruhi flashes back to all times Tamaki wants to cosplay family with her. She wonders silently what his family is like? It really is a testament to what a talented actor Yamamoto Yusuke is that he’s able to make me see Tamaki as a guy rather than an animated character, despite acting like one for the better part of each and every episode. I’ve noticed that each episode finds Tamaki working really hard towards something that is always positive. He yearns to fix something or make it better, so he gives 150% of himself to the task, never caring how ridiculous it might be. Ouran has such a good heart in it’s storytelling, never aiming to deconstruct anything meaningful, but rather aiming to build up the simplest of things such as friendships, trust, and emotional growth. 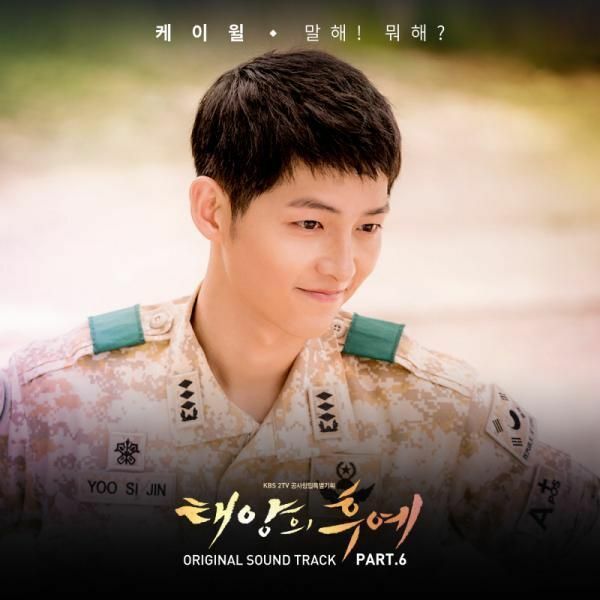 What ties it all together is this sense of fun – the characters are really happy in this drama, living the life of school kids that we idealize as possible, finding joy in positive ways and learning to be happy with yourself. Haruhi remains the most sensible and grounded one, though Kyoya is as well, but he lets the other guys cosplay to their heart’s content while he makes sure everything is running smoothly. He’s the logic to Tamaki’s heart, while Haruhi remains forever the Charlie meeting the other four winners of the Golden Ticket, bewildered but rather intrigued by the oddity. I enjoyed learning Nekozawa senpai’s backstory, but mostly for the light it shed on Tamaki’s childhood and why he’s so intent on spreading happiness and joy the world over. I suppose he can just throw money around to buy people the happy, but he’s elected to use his personal charm and attention to do it one guest at a time. A very interesting concept for him to have, and I’m curious to see whether I’ll gladly jump ships the more I see of calm and mature Tamaki. Ehhh, not bloodly likely since Kyoya has my number. 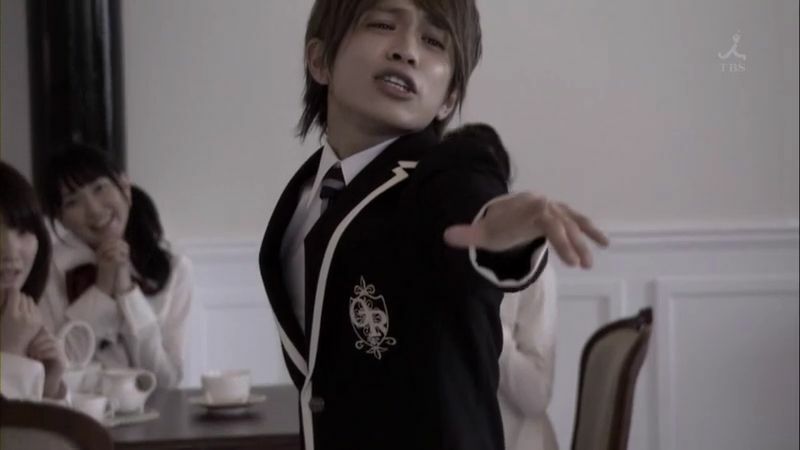 But I genuinely adore the ball-of-love that is Tamaki. i’ll be a willing accomplice! I just think her hair looks like a wig, I don’t like the hair so stiff and unnatural.. unlike horikita maki in Hanakimi..
Kyoya (and Mori) in badass police uniforms? Yes please! Now if only this had been one of those fan service episodes where they take some of their clothes off…. 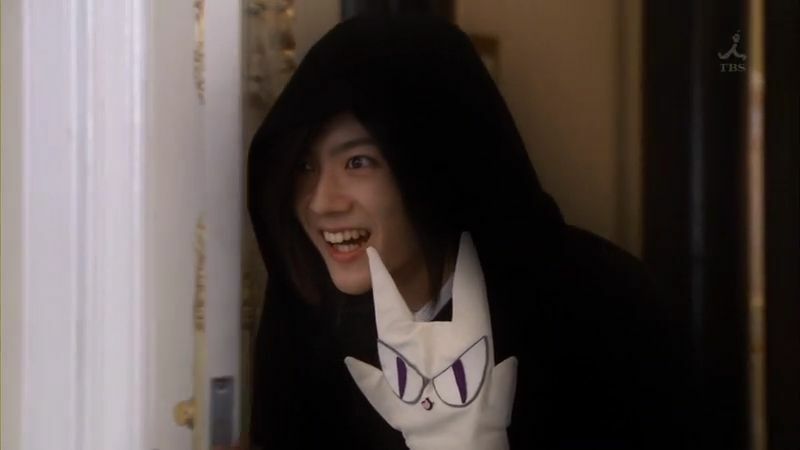 I liked seeing Nekozawa’s entire face, if only because every time he makes his scary prediction face, it reminds me of Jang Geun Suk’s various Tae Kyung expressions. And d’awwwwww Kirimi is too cute. Kyoya lookin’ all badass in his sunglasses! 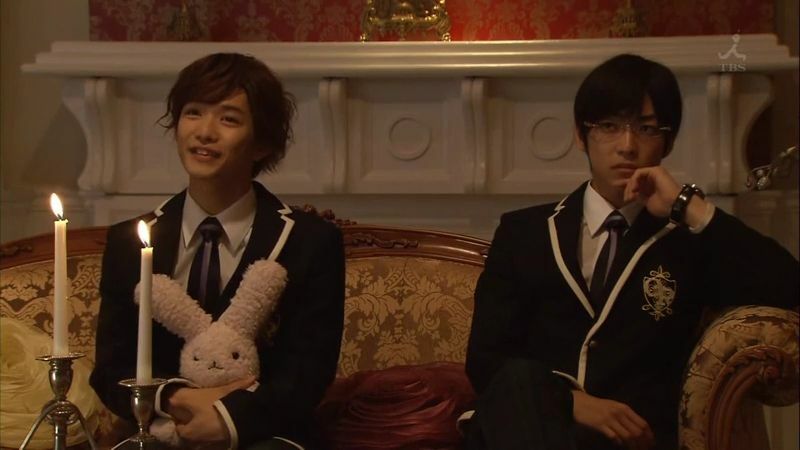 Loved that Tamaki is the heart, Kyoya is the head… really makes sense esp with their bromance. Ah, its here. Yup, can’t wait for tamaki’s family. Thanks for the recap. Tamaki is such a precious and loveable idiot. 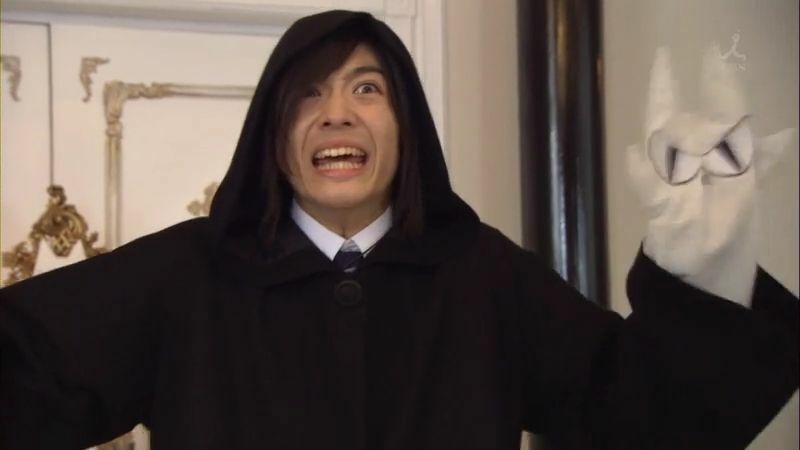 His reason behind the creation of the host club broke my heart, but it made me love him even more. For the amount of affection he gives out to others, and for the things he had to put up with, the boy deserves a lot of loving. oh…this episode totally wrecked all my earlier ship preference(s)… I still love the possibility of Haruhi and Kyouya (and my gawd, him in that police uniform is driving my hormones up the wall) and I have a soft spot for Haruhi and the Twins, but Tamaki and Haruhi make sense and he deserves to be loved by the one he loves…..sigh, for my sanity, I say they should just stay as one big happy family. I never really shipped any pair in the manga or the anime because Haruhi is awesome with everyone and because the mangaka does such a good job of just balancing out the story in terms of characters, romance and comedy. But in the live-action, even though I still don’t ship anyone, I just want to see Kyoya and Haruhi in the same shot together. 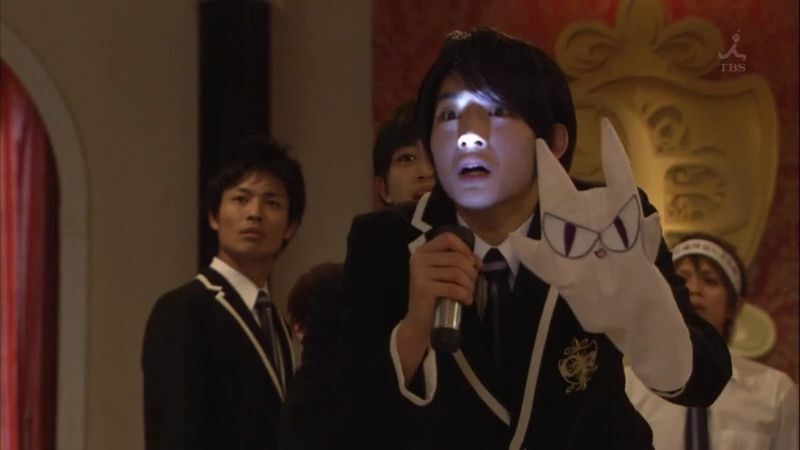 Like you said, Ouran is such a little ray of sunshine. I loved the “No shadow!” “Yes Shadow!” “NO!NO!NO! No shadow!” “Oh my God!”. It was sooo cute and funny cauz they said it in english, it was my favorite part in the show!!! 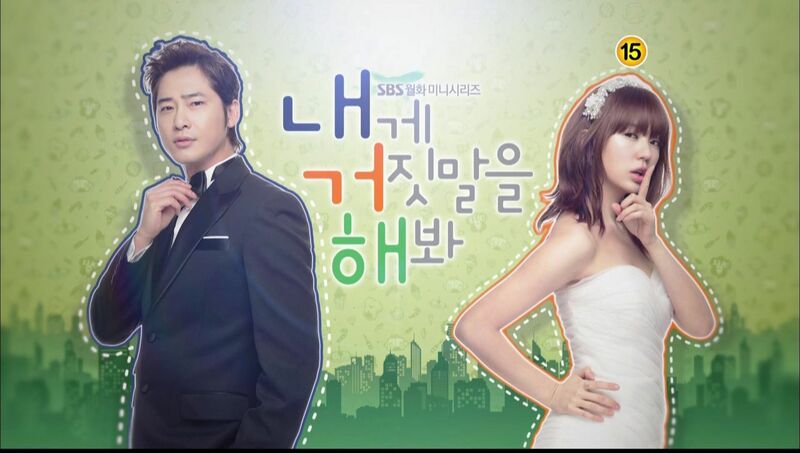 Oh my, this show is so refreshingly crazy and heartwarming! The episodes are over much too quickly! 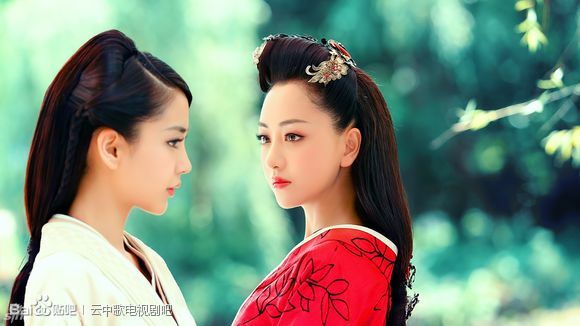 One thing I’ve noticed that impresses me is: compared to most dramas I’ve seen, this show has broken down ALL class barriers. The fascination the rich boys have with the everyday stuff of regular/poor folks is uplifting and hilarius! They love their Haruhi and accept her with no reservations – how lovely!